If you read my post from earlier in the week then you saw the outside of this adorable cake, but I think the thing that makes this cake so cool is the inside! 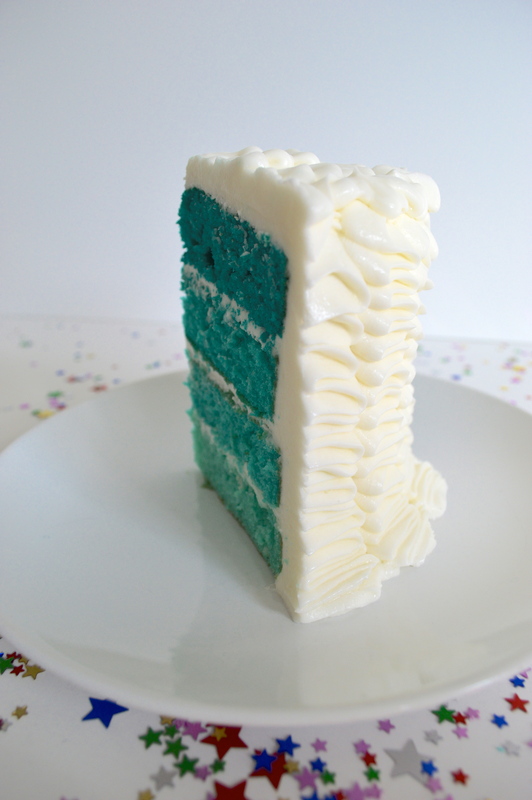 Ombre colored layers of white cake sandwiched with buttercream frosting gets covered in “ruffles” of buttercream giving it a really whimsical look. This cake is amazing because you can customize the colors to make it perfect for any occasion… I think it would be perfect for a gender reveal party, a kids birthday, valentine’s day, etc. The best part is that it looks unique but is really easy to make, you could even use a box cake mix to speed things up even more! 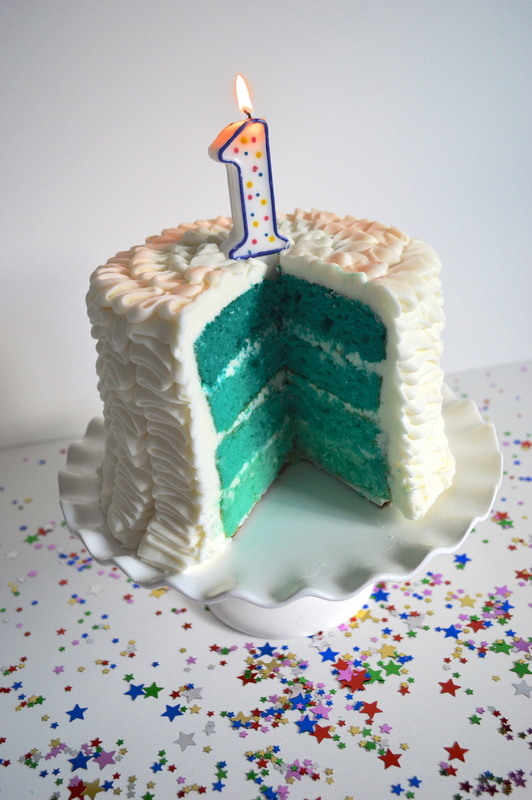 I made a small 9″ cake with four layers but you can make it any size with as many layers as you like! I started of by making a vanilla cake batter (use the recipe for the chocolate chip layers from this post, omitting the chocolate chips). Grease four cake pans (or however many layers you’re doing) and put a parchment round in the bottoms and grease again. Divide the batter up evenly (I was doing 4 layers so I did 4 bowls of batter) and then dye each one the color that you want. I used a gel based food coloring in teal and I used 1/8 tsp, 1/4 tsp, 1/2 tsp and 1 tsp in the bowls… you want to go from light to dark to get the ombre effect. Put the batter in the cake pans and flatten the batter with a spatula. Bake until a toothpick inserted comes out clean, my layers were thin so I think it took about 16 minutes. Let the cakes cool on a wire rack in the pans for 20 minutes, then remove them from the pans and let cool completely. Cut off the tops to make the layers all the same size and level… Wilton makes an amazing leveler that’s adjustable so that’s what I use. 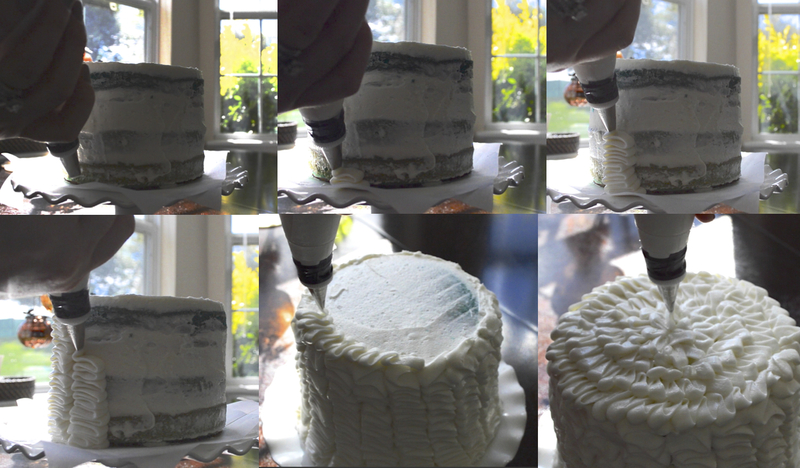 Make the buttercream according to the steps in this post and stack the layers, starting with the lightest color on the bottom. 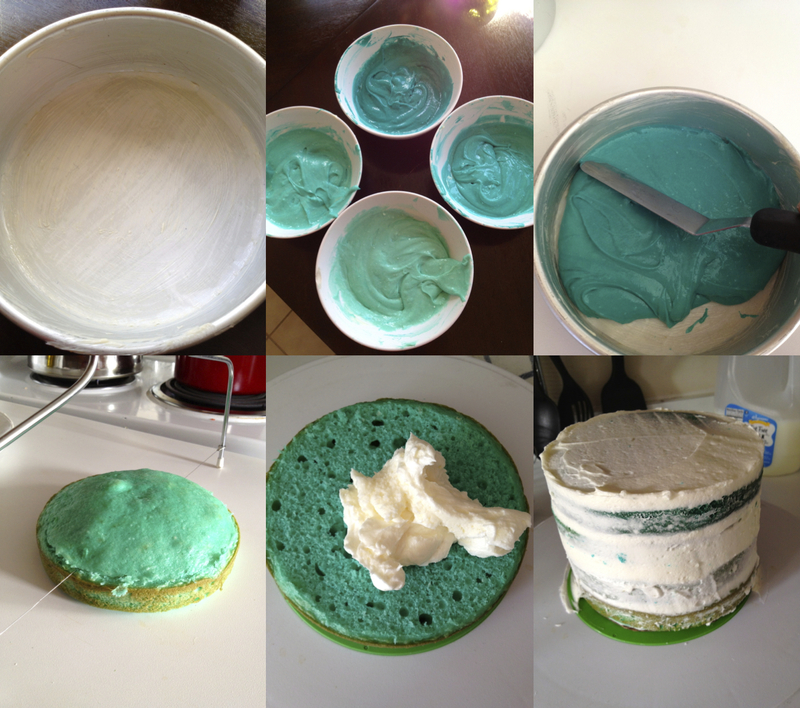 Put a good amount of buttercream in between each layer and once they’re all stacked “dirty ice” the whole thing. This is basically putting a thin layer of buttercream to fill all the gaps between layers and seal in all of the crumbs. Once it’s dirty iced put the cake in the freezer for about 20 minutes to let it set up. Take the remaining buttercream and put it in a large pastry bag fitted with a #103 tip. Once your cake is set up and you’re ready to do the ruffles, transfer the cake to a rotating stand and hold the pastry bag straight up and down with the fatter opening of the tip in towards the cake and the skinnier part facing you. Move fast back and forth in about a 1″ section, going all the way up the cake to make the first row of ruffles. Rotate the stand a little bit and repeat right next to that row. Continue doing this until all sides of the cake are covered. Move in zig zag rings around the top of the cake until thats covered and you’re done! Thanks! I made the buttercream according to the recipe in the link which is actually a double recipe. This made enough to full in between the layers, give the cake a crumb coat and do all the ruffles plus there was some leftover. You could probably get away with making a little less but I always say it’s better to have extra icing then not enough! ← Making It With Danielle Turns 1!